The trend in nursing mirrors a wider one unfolding in other sectors such as manufacturing and office administration, which are demanding more education and skills than in the past. Such “upskilling” in reaction to a slack labor market was particularly intense in nursing, which saw a flood of new entrants over the past decade. Others say the evidence shows that better-educated nurses lead to improved health outcomes, and that the skills taught in a bachelor’s-degree or BSN-completion program are increasingly relevant to the way care is now delivered. All of these points amply support the choice to pursue a DNP. According to a quick search over at mega job site Indeed.com, it looks like the strong job growth for DNPs continues. While recent growth may look diminished compared to the large spike centered around January 2013, recent numbers indicate continued strong growth of more than 200 percent. 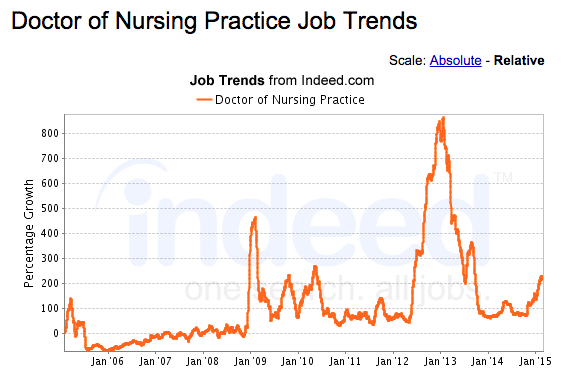 Note that this information is based only on the number of job listings in Indeed.com’s database that contain the term “Doctor of Nursing Practice,” but the site and dataset seem large enough to be illuminating. Can DNPs Use The Title “Doctor”? When a professor with a PhD in mathematics refers to himself as a “Doctor,” we might have various reactions, from impressed to annoyed, but we are unlikely to be confused. Someone who seeks medical advice from such a “doctor” has only themself to blame. Within the medical field, however, who gets to lay claim to the title “Doctor” has more serious implications, and the advent of the Doctor of Nursing Practice (DNP) degree is bringing the issue to the forefront. Whatever our feelings about the practice, professionals who have achieved very high levels of education earn the right to be referred to as “Doctor.” This usually applies to a Doctorate or to the terminal degree in a field of study. Based on this custom, it would appear appropriate for nurses achieving the Doctor of Nursing Practice to refer to themselves as “Doctor.” The common understanding among patients, however, is that their “doctor” has completed medical school and the associated residency and other training necessary to achieve that position. Against that backdrop, referring to DNPs as “Doctors” could cause significant confusion. Some urge nurses of any degree to avoid referring to themselves as “doctors” to avoid confusion among patients, though this group likely includes many doctors concerned about protecting their status. Others rightly acknowledge the increasing role that highly trained nurses play in patient care. Different states are taking different approaches to this issue, as shown in this table (though please note that it is unclear whether that information is being updated regularly). In 2011, the New York Times wrote an interesting article on the subject, which weighs the issue from several perspectives. There is no clear answer to this question at the moment, and it will like be quite a while before we settle into new conventions. In any case, current and prospective DNPs should be aware of the issue, and should verify the requirements in their home state. With all of the recent attention that the DNP degree has received, and the explosion of DNP programs across the country, I was surprised to read that as of January 2014, there are still only 2,443 DNP graduates so far. This number will increase quickly in the near future, as there are almost 15,000 students currently enrolled in DNP programs, but even that is a small number relative to the industry in general. As noted on our DNP salary page, the DNP does appear to confer a salary advantage. It is possible that the relative scarcity of DNPs will further contribute to that difference. I also wonder whether there may be a “first mover” advantage for people who acquire the degree soon — until the number of DNP graduates increases, the demand for DNPs could outweigh the supply, potentially pushing salaries up.